MRB wrote: http://teamrock.com/feature/2017-10-03/ ... e-survivorChris recorded his parts of the album in his home studio !! He recorded his parts here, in his home studio. “They have to drag albums off me,” he says. “If you’re not careful, you just polish. And that’s a weakness of mine." and right after he talks about polishing, well that is clearly happening when you don't record with the band in the studio with the outside producer! 2) he is still not in peace with his commercial times with Magnet/Warner so I can hardly persuade him or his manager to do reissues as I planned to. Even considering that, in fact, he is not sincere and actually doing commercial things, though putting them as if they were not (Jazzee Blue label instead of actual BMG, doing the hits for German big venues and all this crap). The 40th anniversary Benny Santini reissue and 30th anniversary Road to Hell could have been great project for 2018-19, I even planned a professional 3D presentation of such products, but now I see no sense in that, since Chris definiltely still sticks to his Jazzee Blue label and BMG is just an aid for distribution, which was already pretty obvious before, with all the same old stuff we have been seeing for the last 10 years, at least. Thank you Andrew for sharing your insides as well as thought about Chris and his problems. I suspected all along he's in a difficult financial situation. That's why he had scheduled so many gigs in Germany alone. He wasn't ready to play for his fans in other places, I guess, because he had to concentrate on making badly needed money. Perhaps it wasn't Chris himself who decided on that. It would have rather been the management to be blamed for it. One way or another Chris is entangled in the net of business connections as well as obligations and it's difficult for him to break free from it. But in the end I have his newest recordings and everything else is beyond me. Chris wrote: Tomorrow's the day, eh Andrew? I'm waiting for your impressions. yes, CR is here in St. Pete tomorrow and yesterday he was in Moscow. The first reviews are positive, except for the arena's sound quality. Chris is told to have been relatively cheerful and energetic but moved with troubles. Moscow gig was not sold out, but those who have been there yesterday say the arena seemed pretty stuffed, which surprised me. Arena in St. Pete is even bigger and the tickets sales, even though they boosted shortly before the gig date, were pretty poor, so I think it was not a good idea to put Chris into the big arena after 3 gigs here (2008/2010/2012) in a smaller and cosy one with better sound. I pick my free tickets before the gig tomorrow, no idea which seats they assigned me... Hope not too distant from the stage. For my offer of interview or meeting with CR at the soundcheck in exchange for my help in promotion and other things, it was either declined or not even looked into by the management. But a young friemd of mine who helps me run the Russian fan page, got in contact with Mal Maddock who forwarded his request to the tour manager and hopefully he will meet CR team at their hotel. So pity Warsaw was not on the list this time (as well as Riga, Minsk), which is very strange. Did you get a chance to see Chris and his management? All his albums are now on Spotify. So I can't imagine he's not interested. In brief: there was no chance to meet CR team anywhere apart from the gig itself, so no any hint on having a chat, unlike Moscow, where my friend (Brian May fan and promo-guy) has met Chris inside the arena, but only for an autograph (on Queen's Kind of Magic CD! ), he also saw other people asking for signatures, but Chris even refused, at least once, to sign a poster, which surprised me. In St. Petersbug my friends also could not catch Chris in a hotel or at the backstage (only some promo-guy managed to get a signed poster, don't know how), but Ivan was approved by Chris to climb the stage after RtH at the gig, took pictures and videos of him and smiling Chris together, and also picked 2 CR plectrums he threw (one he granted to me!) To my memory, he is the 1st ever fan who was granted such opportunity. Chris told the rushing securities to let him go on stage for a minute or so. 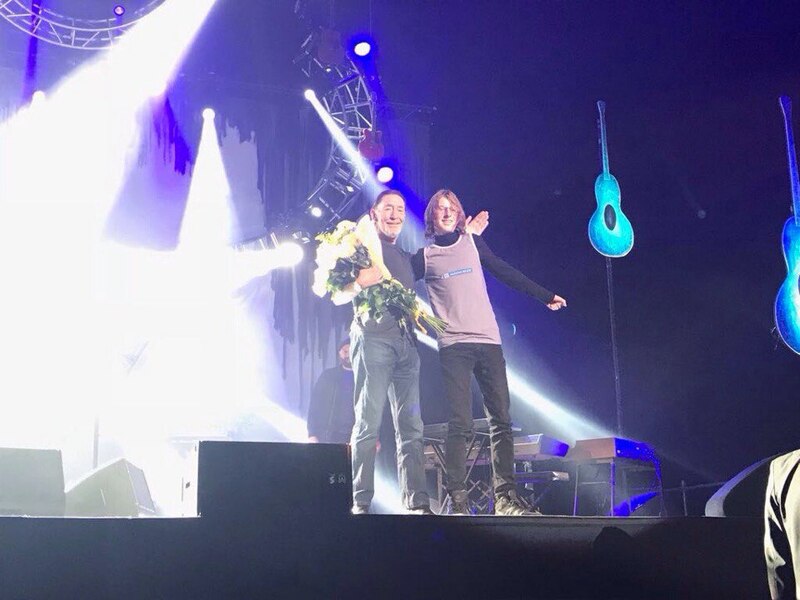 I was very happy for bot Ivan and Chris who definitely felt very relaxed and enjoying the show and was cheerful towards the audience and spoke some words and made emotinal signs, which really pleasantley surprised me after years of gigs with almost no smile or chat at all. Last edited by andrew fischer on 16 Nov 2017, 11:26, edited 2 times in total. What a shame. Maybe it will change. Like I said all his old work is on Spotify now. So there is interest. Don't you think? I know you don't have Spotify, but it is a sign there is some change somewhere. I know of your friend, he posted a picture to me. I was amazed they let him do it. I guess Chris likes young fans! And all those flowers. He won't accept them here. 3 weeks until Dublin. I'm curious if I get Driving Home For Christmas live (6 december). ann268 wrote: What a shame. Maybe it will change. Like I said all his old work is on Spotify now. So there is interest. Don't you think? I told Ivan that he has an ace in his sleeve - his age. That is the main reason, I think, why Chris accepted this outrageous action, and he did that sincerely smiling. His sincerity at the gig was what really made me and my wife happy for him and for us that we will remember him like that, smiling through his pain and getting kinda high from public performance, and not that grinny old man what he has been being for years before. 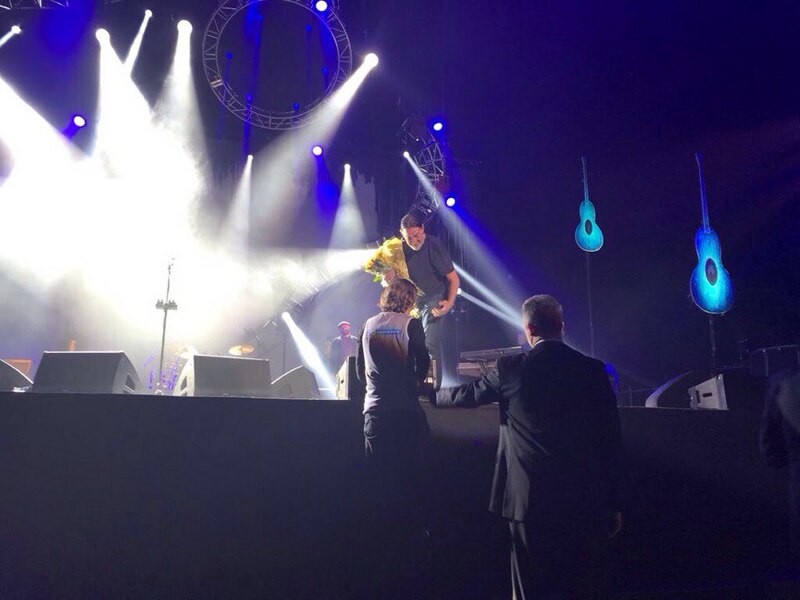 The flowers for the artist at the gig is kinda traditional here in Russia and Chris seems to know and accept that. It clearly made him sincerely smile, in both Moscow and St. Petersburg. I really wish you once more cheerful show in Dublin and hope the Christmas hit will be played. It is a 'must have' for late concerts shortly before Christmas, though in Dec'91 Chris only playedWinter Song and Footprints as Xmas tunes. For Spotify, not so sure, it may be just vice versa, they will say it is okay with just the old albums available online with no reason for expanded reissues. BTW, I suspect the main funds from old rec's on Spotify is collected by Warner. So now I am sure I have to talk to them on the old records. I have the official setlist, it has Driving Home For Christmas on it. Julia or Money won't be played. It would suprise me if he did another one. But you never know. I'm glad you have happy memories. Never give up on your dreams. Like your young friend. ann268 wrote: I have the official setlist, it has Driving Home For Christmas on it. Julia or Money won't be played. Yes, I remember you telling me that. Shame such a cool live number as funky Money won't be played. I really liked its performance, and others mentioned that too. I wish it could have been Road Ahead dropped to include Driving Home into the set, or Happy on the Road. Even Looking for the Summer dropped as it was in 2014 would be better than Julia/Money dropped... Maybe Chris is going to make set shorter that way, since now it was almost 2-hour gig (1 hour 47 minutes, I checked the clock) with hardly any pause in it. Maybe he changes his mind if he feels good further on. Yeah, accepting flowers, cheering with a young fan on stage, all these gestures are always well received, everywhere. Especially in Russia but I think in other places, too. Over here if an artist refuses to accept flowers it would be viewed as a rude behavior; at least as "not proper in the circumstances." What he would do with the flowers is, in fact, irrelevant. After all he can always throw them back at the audience or ask they be taken to a senior citizens' home. I'm pleased to hear that Chris was so warmly received in both Moscow and St. Petersburg. Furthermore, I hope he will be successful at that to the end of this tour. And I'm happy to hear you Andrew and your wife had great time in the audience. I would like to share some more details, apart from the overall emotions. What I really miss within recent CR gigs, are his old guitars - two strats, especially Bluey, Blue Italia and Thinline. Overall he only performed 5 songs through the gig on these guitars and Bluey is long since absent at all, but these 5 songs moved my heart most of all. To be honest, I am not very fond of the sound of his recent brown guitars, the battered Squier (for non-slide work) and dark matte Italia (for slide). I liked 2 new songs, though, performed live on those guitars (Nothing Left and Money), but it was like a balm to my ears to hear the good old sound of Pinky on Stainsby and esprcially on RtH with slide, Blue Sparkle on Stony Road songs and Thinline on Til' the Morning. Nothing Left Behind, in my opinion, is the brightest song off the new album in both studio and live version, very pleased Chris included it in the set, and Money, opposed to many others treating it as the poorest track off the album, I liked too, in both studio and especially the funky-hard-rock-blues-style live version, one the gems of the set to me. The old non-slide hits (Josie, Julia, Summer, OTB, Let's Dance) were performed in a way pretty similar to that in which they were played though previous tours and maybe even less interesting, so that they sounded pretty bland to me. I hoped for more inventive interpretations. Same with the 2 new singles - I did not like them much on the album, neither did I appreciate them being played at the gig. But it is good that 5 songs off the new album was played, and adding its singles to the set was logical. But what he has done to Stainsby is fantastic! And RtH sounded fresh, too, with non-slide rock solo at the end (maybe just a little bit too bland). These songs have never been my favourites among CR hits for years, and I could hardly imagine I would ever name them as the brightest gems of the set, but this was the time! It was the real climax of the gig, the arena was full of lights from the mobile phones though Stainsby hard-rock part. Even RtH and Let's Dance received less cheer from the audience than the super-driving Stansby! I also would name Til' the Morning Sun as one of the gems, though I missed the charsimatic bridge to it after The Truth instrumental intro and the changeover for non-slide guitar for the final solo, but the total-slide version was still good and really driving. The sound quality was very good, though it is a big arena and not quite prominent for a good sound, but it was there. The band was not so clearly heard beyond Chris's voice anf guitar through the first 2 songs, but then it became much better. All the band musicians performed very well, cannot blame anyone for anything, even Neil's notorious synths were alright to me. Brass imitations and some special effects on synths by Mal Maddock were quite welcome. The stage set and the screen films were harmonic too, maybe some of them a bit too boring (Money and Stony Road), but some of them really beutiful, especially through 2 Lost Souls and Julia. Last edited by andrew fischer on 04 Dec 2017, 14:34, edited 4 times in total.